Review: It is the early days of World War II. The fate of Western Europe balances on the newly-appointed British Prime Minister Winston Churchill. He has to make a choice whether to negotiate with Hitler and save the British people at a terrible cost or rally the nation and fight on against incredible odds. At the London premier of this film, according to Gary Oldman, 26 of Churchill’s family attended, 17 of whom had earlier visited the set. The one thing I was impressed with was Gary Oldman’s performance. This should be one performance that should get a Bafta for Gary Oldman, which would be well deserved. His performance is very believable and real. He spent over 200 hours in makeup undergoing a radical transformation that necessitated ‘fattening’ his body with prosthetics weighing half his own weight. I did think that Brian Cox was more suited to playing Churchill in Churchill, 2017. As good as Gary Oldman is, I didn’t come away thinking what a fantastic film it was. There was one scene, which showed a debate on a train, that got hold of my attention but I wasn’t totally convinced by it. I just couldn’t imagine that it really happened and so I felt that they just added it for the film. There were also lines in the script where I thought Churchill would never have said those things especially to his close colleagues. Joe Wright has directed films such as the amazing Anna Karenina (2012) and also Hanna (2011). Lily James as usual is fantastic. Always great to see her on the screen. John Hurt was set to play Neville Chamberlain but was too ill with cancer. Both Gary Oldman and Ben Mendelsohn previously starred in The Dark Knight Rises (2012). 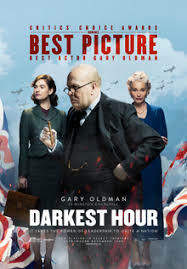 At the 2018 Golden Globe Awards Gary Oldman’s performance in Darkest Hour won Best Performance by an Actor in a Motion Picture – Drama. At the Bafta Awards in 2018 this won two Awards. They were for Best Actor (Gary Oldman) and also Best make-up and hair. At the Academy Awards in 2018 this won two Awards. They were for Best Lead Actor and also Best Makeup and Hair.